A nuclear-themed trivia night could help you to raise money to fund your own campaign for a world free of nuclear weapons. Trivia nights are fun and easy to organize. We’ve come up with some sample questions to use, but you should try writing some of your own based on what you’ve learned about nuclear weapons so far. They can be multiple choice. Set a time, date and location for your trivia night, as well as an entry fee if you want one. Decide on how many people you want for each team. Advertise this information on noticeboards and in your school newsletter. Write some questions suitable for your audience. 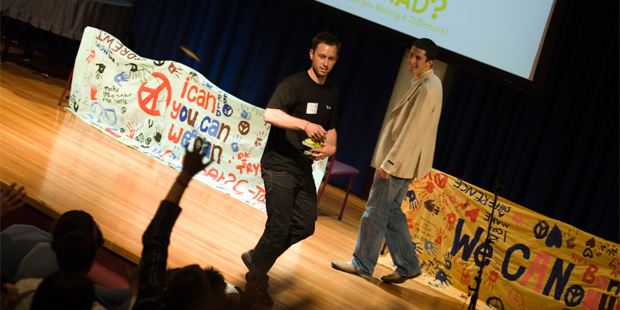 Obtain prizes to give the winning team members – businesses might donate them. On the night, collect money from people and make sure they all have paper and pens. Read the questions out round-by-round and keep a tally of the scores. Announce the winning team and present them with the prizes! On how many occasions have nuclear weapons been used in warfare? What is the US president’s “Emergency Satchel” more commonly known as? Which is the only country in the world to have developed nuclear weapons and voluntarily dismantled all of them? The mayor of which Japanese city heads the Mayors for Peace network? What does the Nobel Peace Prize-winning “IAEA” stand for? The nuclear-free zone treaty covering which continent entered into force in 2009? Name one of the three former Soviet countries which voluntarily gave up their Soviet-era nuclear arsenals in the 1990s. The Non-Proliferation Treaty entered into force at the beginning of which decade? In the insane world of nuclear weapons, what does “MAD” stand for? What name was given to India’s first nuclear test explosion? Jo Vallentine, the first and only person in the world to be elected to a national parliament on the single issue of nuclear disarmament, is from which nation? Which former bodybuilder said in 2007 that the attention focused on nuclear weapons should be as prominent as that of global climate change? The board of directors of the Bulletin of the Atomic Scientists created what infamous clock in 1947? The world’s first nuclear-weapon-free zone covered which chilly geographical region? Which country is widely thought to be the sixth in the world to have successfully developed nuclear weapons, though it refuses to confirm this? What were “Little Boy” and “Fat Man”? Which is the only country to have announced its withdrawal from the Nuclear Non-Proliferation Treaty? What does the “H” in “H-bomb” stand for? Which country has conducted more nuclear test explosions than any other country? What name is given to the United Kingdom’s fleet of nuclear-armed submarines? On the Doomsday Clock, how many minutes is it to midnight in 2011? Which former American First Lady said in 2007 that Ronnie’s greatest hope was for a world free of nuclear weapons? The explosive power of an atomic bomb is created from which of the following: nuclear fusion or nuclear fission? Which of the following has not been formally declared a nuclear-weapon-free zone: the seabed, the southern hemisphere or outer space? Which well-known former diplomat from Ghana stressed the importance of nuclear disarmament and non-proliferation in his final speech as head of the United Nations? Which Japanese word is used to refer to the victims of the atomic bombings of Hiroshima and Nagasaki? Sadako Sasaki, a well-known victim of the Hiroshima bombing, died aged 12 from what type of cancer? Most nuclear-armed countries have publicly declared that they would not use their nuclear weapons except in retaliation to a nuclear attack against them. True or false? Which body held in 1996 that the use of nuclear weapons would generally be illegal under international law? Which organ of the United Nations called in its very first resolution for “the elimination from national armaments of atomic weapons and of all other major weapons adaptable to mass destruction”? Which is generally more powerful: an H-bomb or an A-bomb? North Korea announced on 9 October of which year that it had successfully conducted its first nuclear test explosion? Which US president ordered in 1945 that atomic bombs be dropped on Japan? Name all nine countries which currently possess nuclear weapons. Name all five nuclear-armed countries which are parties to the Nuclear Non-Proliferation Treaty and which have a veto power in the UN Security Council.